PaSsu Diary : Why do we need a religion? why a new one? 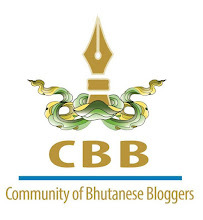 How many of us Bhutanese are Buddhist? Strictly hardly any of us are. Do we care? NO! and this carelessness in us has kept our country at peace so far. The bloodiest wars on earth are fought in the name of religions, thank god we never really bothered to know what religion we are supposed to follow, forget about fighting a war. Buddhism has deep root in Bhutanese history and it has won faith over centuries. Therefore when a child is born he is a Buddhist by birth. Though half understood and half manipulated in blind faith yet our religion is keeping us happy and at peace. And as long as we have that we are ready to call it our religion. Of all the things in world religion should be the last thing to play round with, it's a matter of belief and faith and not something that could be thrust upon somebody with power or influence. Religion is of god and soul and all the good things that it should be the last thing to start a war. But what has happened so far everywhere? We are the last country left, and we are changing- many new religions are breeding in the corners of our streets, and many people are working full time in spreading them. It's like forming gangs, who has the biggest gang has the most power to rule the streets. Buddhism is cool and tolerant and selfless, therefore we never had problems of any sort...now the religions known for wars are coming up in our street, and they are already showcasing groupism and the day is not far when we will have to see Holy Wars! 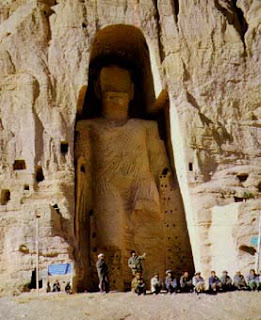 Picture from Google: the ancient Buddha statue in rock before Taliban bombed it down. We didn't say anything. Buddhism is tolerant. All we really need is to treat every other human and other living things (plants, animals) as we ourselves would like to be treated (i.e. with love and compassion) and every good thing will fall in place and make our lives simple to live, in harmony with our neighbours, and the environment safe to live in. This is what I believe. I think there are lessons in religion, but we make the mistake of disassociating them from our day to day life. We reduce religion to mere prayers and rituals that we believe are enough to solve every problem. We forget that we ourselves have the responsibility of making our own lives worth living. This is what I think. people need to believe in something greater than us who can give us hope that everything will be alright ..